Recently a Ku-frequency-based ground receiving station was configured at ITC, receiving images acquired by various sensors onboard ENVISAT over Europe a couple of hours after the images have been recorded. The data are broadcast by the European Space Agency Data Dissemination Service (ESA-DDS) using the EUTELSAT W2A communication satellite situated 10° East. To receive this free data service, a new parabolic antenna pointing to this communication satellite has been installed on the roof of the ITC building. 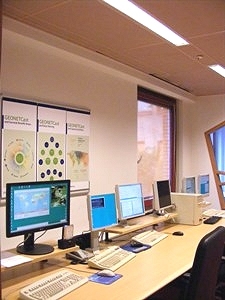 This ESA-DDS European Service, broadcasting full-resolution MERIS images, for example, supplements the data received by the three other services that have already been operationally received at ITC for some time, such as the C-band broadcast of the ESA-DDS and the C-band broadcast of GEONETCast for Africa. These services are received by a single larger parabolic antenna that is placed in the garden of the ITC building. This antenna points towards the Atlantic Bird 3 communication satellite situated 5° West. Because of the C-band frequency, the dish dimension is larger than that used for Ku-frequency reception. Another antenna, also on the roof of ITC, points to the EuroBird communication satellite situated 9° East, receiving nearly all GEONETCast Ku-frequency data services. The various low-cost and off-the-shelf ground reception station hardware and software components have been newly set up and configured to effectively check and monitor reception, prepare animations of newly received near-real-time data, and produce new products. All newly received data are stored for various periods of time on a 15 TB file server (NAS) that can be accessed within the ITC network. Some older data, especially those from Meteosat Second Generation, are transferred to external disks and can be provided off-line upon request. This new set-up facilitates effective training and capacity development in system set-up, administration and management for new Ku- and C-band frequency GEONETCast and ESA-DDS users. To use these environmental data streams for education and research, various freeware tools are available. In addition, GEONETCast and ESA DDS toolbox plug-ins have been developed under ILWIS 3.7 for data import, visualization, data processing, etc. Currently, over 200 satellite image data types and derived products disseminated by these data streams are supported. Further software development is ongoing to support efficient import, visualization and processing of new products in these data streams. All utilities can be freely obtained from the “Download” area at 52North (http://52north.org). Moreover, additional information with respect to these global telecommunication-based free data dissemination services can be obtained from the newly established “Earth Observation” community at 52North. The facilities are located in room 1-005A of the ITC building, opposite the ITC service centre helpdesk on the first floor. Additional information can be obtained from Ben Maathuis (b.h.p.maathuis@utwente.nl), Chris Mannaerts (c.m.m.mannaerts@utwente.nl), Petra Budde (petra.budde@utwente.nl) or directly at the IT helpdesk.